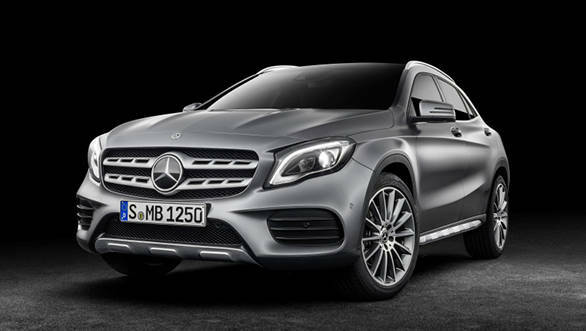 Earlier this year, Mercedes-Benz unveiled the 2017 GLA facelift at the Detroit Motor Show. The updated GLA SUV mainly received design revisions to make it a strong rival against the likes of the BMW X1 and the Audi Q3. Mercedes-Benz India has now confirmed that this refreshed version of GLA will be launched in India on July 5. The front of the 2017 Mercedes-Benz GLA facelift gets redesigned headlights wherein full-LEDs have replaced the bi?xenon setup that was offered in the previous model. Additionally, the grille design too has been altered to highlight the width of the SUV. The other changes done to the design are the tweaked bumpers and new lightweight alloy wheels. The international spec model also comes with a canyon beige yellow colour. We believe this might make it into the country as well, since Merc has launched unconventional colours in its models in the past. Importantly, the changes done to the overall design of the Mercedes-Benz GLA facelift have also brought down the coefficient of drag from 0.29 to 0.28. 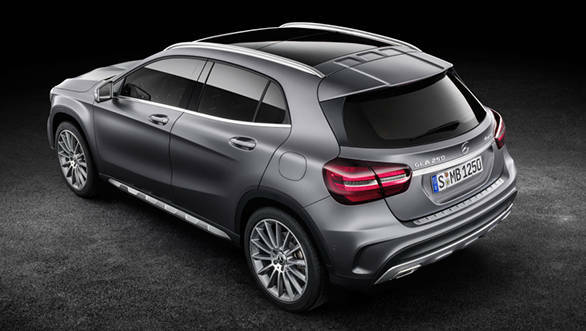 While there are distinct changes outside, the cabin of the 2017 Mercedes-Benz GLA facelift carries the same design theme as the previous model. However, it gets a bigger 8-inch infotainment screen with CarPlay and Android Android Auto connectivity options. The instrument cluster sports new dials with red needles. The electric seat adjustment switches as well as the stowage compartment in the centre console are now finished in chrome. The upholstery colours too have been revised and so are the lines on the Artico leather seats for that additional premium appeal. In terms of safety, the international model comes equipped with Active Brake Assist as standard. This system alerts the driver when the distance between the vehicle ahead is lesser than safety limits and also intervenes by automatically braking. Additionally, If the system detects that the driver is reacting too late, it initiates autonomous braking in order to prevent the collision or minimize the consequences. At the time of its international unveiling, Merc also introduced a 184PS/300Nm GLA 220 4MATIC petrol model to the GLA line up. However, the India-spec GLA facelift will continue to be powered with an option between the 2.0-litre petrol and 2.1-litre diesel engines. 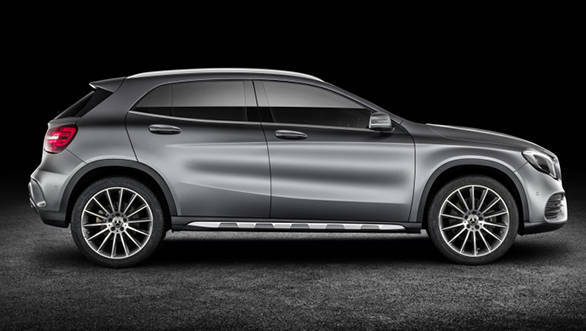 The GLA facelift, like its predecessor, will be assembled at the Mercedes-Benz plant in Chakan.